A team of researchers led by Prof Ranga Myneni of Boston University, USA, a winner of the prestigious Humboldt Research Award and a long-term guest at the Max Planck Institute for Meteorology (MPI-M), show in a new study that there is now about five and half million square kilometers of extra green leaf area yearly compared to the early 2000s. This increase is mostly due to intensive land-use in the two most populous countries, China and India. This result is a surprising twist as a previous study by some of the same researchers found carbon dioxide (CO2) fertilization as the main reason for the greening of Earth’s lands. 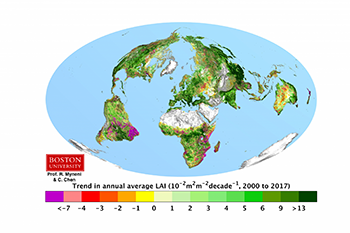 Prof Myneni collaborates with the research group of Prof Victor Brovkin, group leader in the department “The Land in the Earth System” at MPI-M, on observations and modelling of the Earth’s greening trend. Every year, about one-half of the 10 to 11 billion tons of carbon emitted in to the atmosphere from burning of fossil fuels and tropical deforestation remains temporarily stored, in about equal parts, in the oceans and land plants and soils – the so-called carbon sinks. “Unlike greening due to large-scale tree plantations in China, sustainable forestry practices in Western Europe and tree re-growth on abandoned lands in Eastern Europe, greening due to intensive agriculture does not enhance the land sink because crop carbon quickly returns back to the atmosphere” said co-author Prof Victor Brovkin from MPI-M, and a lead author of several chapters in past and upcoming IPCC Assessment Reports. He added that although browning is observed in only 5% of the global vegetated area, some of this is in the pristine tropical forests of Brazil, D. R. Congo and Indonesia, raising concerns about those ecosystems’ resilience and sustainability.